Information about the forthcoming Deep Purple tribute album, "Re-Machined: A Tribute To Machine Head," has been coming out a little at a time, including preview video clips and a few full songs. Now, a full-length behind-the-scenes look at the album has surfaced. Fans can dig deep into the project, with studio footage and interviews with Metallica, Jimmy Barnes, Chickenfoot, Steve Lukather, Glenn Hughes and many more of the players involved. 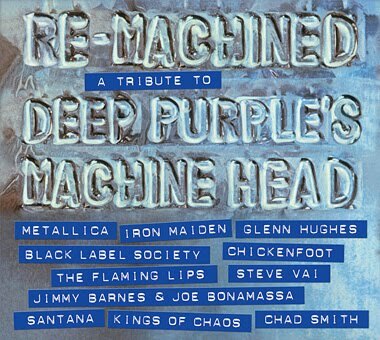 Due September 25, the compilation CD featuring re-interpretations of Deep Purple’s landmark 1972 album with songs recorded by Metallica, Iron Maiden, Chickenfoot, Black Label Society and more. Deep Purple’s most successful record, “Machine Head” reached number 1 in the UK and stayed in the top 40 for 20 weeks; it reached number 7 in the United States, remaining on the Billboard 200 for 118 weeks. "Re-Machined: A Tribute To Machine Head"